Commercial 6D - ost.rok powstało 20 sztuk. Morris Minor has 847-cc (57 x 83 mm) four-cylinder engine, rated at 8.05 HP. The chassis is available for £100, complete cars costing from £125 to £140. Wheelbase is 6 ft 6 in. Morris Oxford Six has a 30.5-bhp 1938-cc (63.5 x 102 mm) side-valve Six engine, rated at 14.9 HP. The chassis costs £185, complete cars from £250 to £285. The Morris Major programme at the Motor Show in October: Chassis £160, Tourer £210, Sports coupé £245, Saloon fixed or sliding head £199.10.0 or £215. The fiscal horsepower has been dropped to 13.9. with a cubic capacity reduced to 1803 cc (61.25x102 mm vs. 63.5x120 mm). The six-cylinder engine has a four-bearing crankshaft, an air-cleaner-heater and a fume-consumer head. Other standard features now includes chrome finished automatic radiator shutters, a four-speed twin-top gearbox, Lockheed hydraulic brakes and a wide 52 inch track. 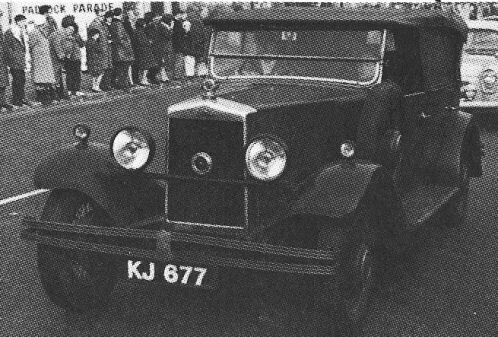 Just befor Chrismas 1930 Sir William Morris announced a new car to sell at £100. The new Minor S.V. was ready a few months later, featuring a two-door saloon body and a side-valve engine. 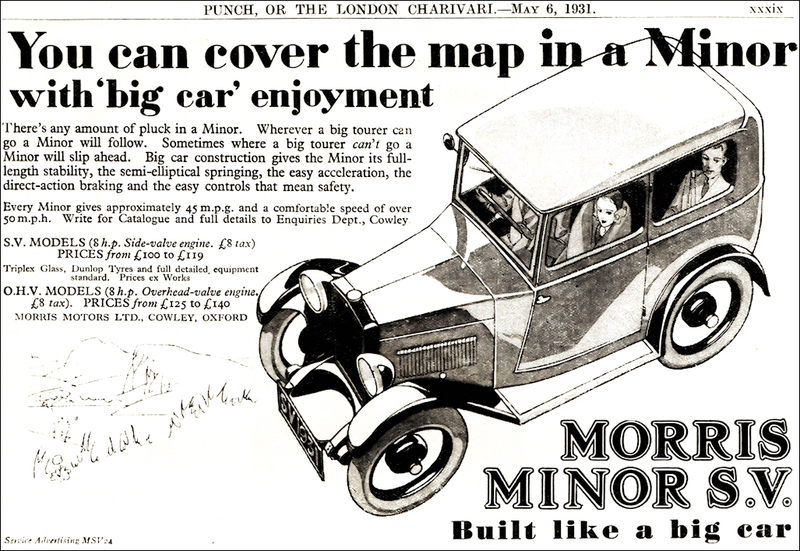 In August the Minor gained a new shape radiator grille.Three body styles become available costing £100 for the basic two-seater, £115 for the tourer and £112.10 for the saloon. 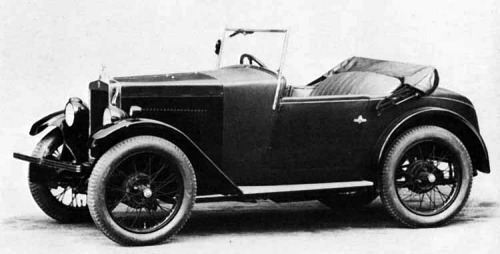 The overhead-valve version of the Minor was renamed the Familiy Eight with four-door body, a 7 ft 7 inches wheelbase and hydraulic brakes. This made it a new model placed between the Minor and the Cowley. The four-door costs £152.10.0 and the sports coupe with skiding head £175. A considerably changed Cowley was announced on 29 August. 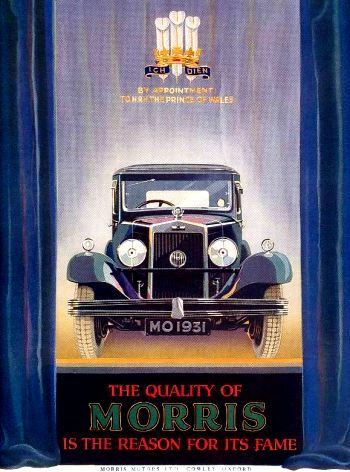 In common with the rest of the Morris range of now six models the Cowley was redesigned for more pleasing appearance with a fashionable "eddy-free" leading edge to the roof on closed cars. Petrol tank is located at the rear of the chassis, chrome finish to all bright parts, Magna type wire wheels are standard. There is a new chassis frame giving a lower body. Springs has been made longer and more resilient. Lockheed fydraulic brakes with bigger brake drums. A sports coupé body is added to the range but four seater tourers are no more available. Either the 1550 or 1802 cc engine can be had for the same price. 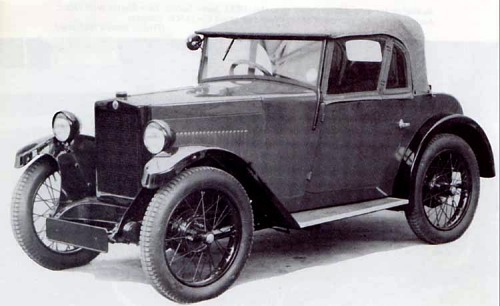 Morris-Commercial Model 6D Saloon is built in limited numbers for 'colonial' and military use. The engine is a 26.8 HP six-cylinder with 85 x 125 mm bore and stroke, developing 74 bhp at 2800 rpm. Power is transmitted through a four-speed gearbox to the worm-drive tandem rear axles. There is also the Model TD which has a 17.9 HP four-cylinder engine with the same bore and stroke as the 6D. Basically a 6 x 4 truck chassis it is available with Tourer bodywork.